Aldeyarfoss is one of the most beautiful waterfalls in Iceland, found within the north highlands in the Skjálfandafljót river. 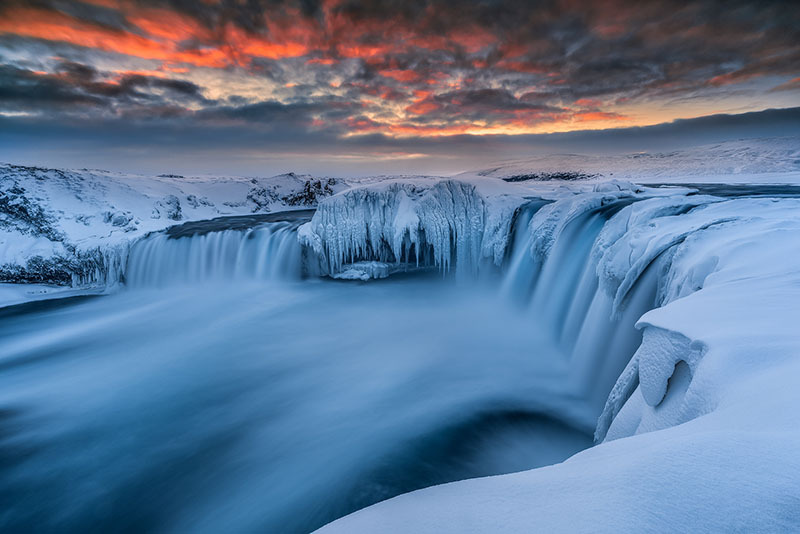 Aldeyarfoss stands at twenty metres tall, and plummets into a beautiful blue lagoon. It is best known for its surrounding geology, as on either side of it are rows of hexagonal basalt columns, features found in few places around the world. These columns are so perfectly formed and symmetrical that they seem to be carved by hand. They can, however, be explained by physics. When lava was flowing down the cliff faces at Aldeyarfoss during an eruption centuries ago, the outer lava, which was exposed to the air, cooled into solid rock fasting than the layers beneath. In this case, the lava was moving in a way that meant it cooled quickly at the same rate over an even surface. This caused the lava to contract equally across its surface into cylindrical columns, that cracked into the hexagonal structures due to the different levels of pressure in the rock. These basalt columns can be found in several places around Iceland, such as along Gerðuberg on the Snæfellsnes Peninsula and at the cliffs in the village of Hofsós. The only other easily accessible waterfall with them, however, is Svartifoss in the Skaftafell Nature Reserve, in the south-eastern corner of the country. At Aldeyarfoss, the columns are more diverse in colour than their black counterparts at Svartifoss, with yellow and red shades created by the sulfur and iron brought up in the eruption. Aldeyarfoss is the most second most popular waterfall in the Skjálfandafljót river, losing out to Goðafoss which sits a more accessible location and has an interesting history. This falls is found on the road between the two most visited sites of the north, the town of Akureyri and Lake Mývatn. It is famous for being the location where Iceland symbolically marked its departure from paganism to Christianity in 1000 AD; here, the lawspeaker at the time threw away his idols of the Old Norse Gods, where they were consumed by the rapids. Aldeyarfoss and Goðafoss are not the only waterfalls in the Skjálfandafljót river, however. Just to the south of the former is Hrafnabjargafoss, a horseshoe shaped falls that stands at five metres tall. 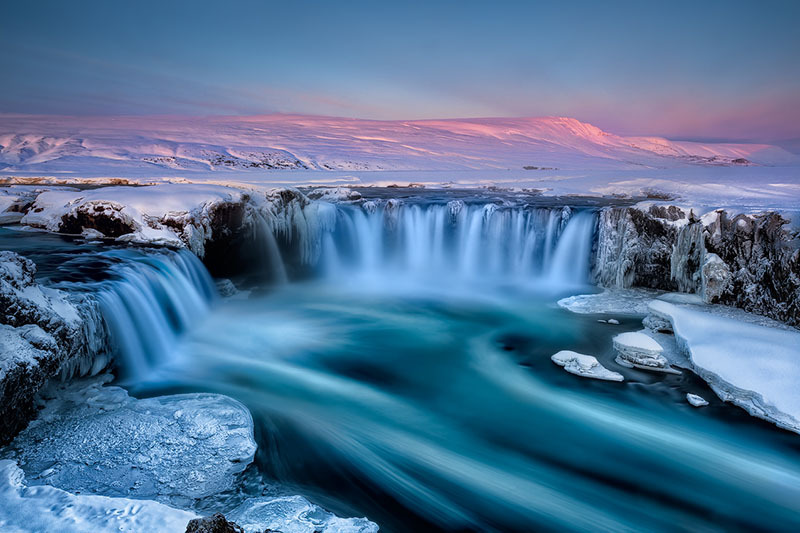 Others include Ingvararfoss, Barnafoss and Ullarfoss. Aldeyarfoss is located just inside the north Icelandic highlands. It can be reached by turning onto Route 844, which leads off the Ring Road between Akureyri and Mývatn. This road will lead onto Route 842, before it continues onto a highland track, the F26. Highland routes should only be approached in a four-wheel-drive. This route will lead to a carpark on the southern side of the waterfall, which provides excellent views over the falls. It can, however, also be viewed at its north bank. To reach this less-known area, turn off Route 842 when you see the signs for the farm Stóratunga. This route will take you past the aforementioned Ullarfoss falls, renowned for being fed by clear springwater, and over a bridge. You will then turn left on a gravel road signposting towards to Aldeyarfoss, follow it to a small carpark, and from there take take a short hike to the northern bank. Skjálfandafljót is a glacier river that has its source at Vatnajökull, Europe's largest glacier. It is 180 kilometres long, making it the fourth-longest river in Iceland. The water in the river is not solely glacial, much springwater pours into it from the Ódaðahraun lava field, hence there is much trout and salmon in it. Several beautiful waterfalls are found in Skjálfandafljót, i.e. Aldeyjarfoss, Hrafnabjargafoss and Goðafoss. The river is also highly popular for rafting. Hrafnabjargafoss is a waterfall located in the Skjálfandafljót river, one of the longest rivers is Iceland. It is little-known compared to other waterfalls in north Iceland, making it somewhat of a hidden gem in the region. It can be found alongside a highland road that is only accessible in summer. Hrafnabjargafoss is but one of several falls found in the Skjálfandafljót river. The most famous of these is Goðafoss, which sits several miles north, on the road between Akureyri and the Lake Mývatn region. This easy to access location and its history, being the place where Iceland marked its conversion to Christianity in 1000 AD when idols of the Old Norse Gods were tossed here, means that Hrafnabjargafoss has always sat somewhat in Goðafoss’s shadow. That does not mean, however, that it is any less beautiful or worthy of a visit. Though only about five metres tall, it falls from a unique, horseshoe shaped cliff in several chutes. It is surrounded by moss covered lava rock, black sands and some greenery in summer, and boasts stunning highland views to the south. Other waterfalls in Skjálfandafljót include Aldeyarfoss, famous for the hexagonal basalt columns that cluster around it; Ingvararfoss, where two rapid falls mean at a tumultuous point in the river; Barnafoss, not to be confused with a waterfall of the same name in west Iceland; and finally Ullarfoss, which is fed by fresh springs. Hrafnabjargafoss is really only accessible in summer, unless on tour in which specialist vehicles, equipment and guides are needed. This is because it is located on a highland road that is closed to the general public in the winter months as it is not maintained and thus often covered in snow. Even in summer, it can only be driven to in a four-wheel-drive. From Akureyri, where most people stay when in travelling to the north of the country, follow the Ring Road eastward until you hit Route 844, where you will turn right towards the country’s interior. Follow this road onto Route 842, and continue onto the F26. This journey will take you past one of the aforementioned waterfalls, Aldeyarfoss, which is also well worth a stop. Once you reach Íshólsvatn lake, you will find a trail that leads five hundred metres away from it to the left, which will take you to the feature. The journey, without stops, will take you approximately an hour and a half. Being an attraction in north Iceland, a visit to Hrafnabjargafoss can be just a part of an extensive day of sightseeing, and to more than just the waterfalls of the Skjálfandafljót river. This region boasts the Mývatn area, a series of lakes surrounded by geothermal and geological wonders, such as the Mývatn Nature Baths and Dimmuborgir lava fortress respectively; some of its features are both geothermal and geological attractions, such as the Grjótagjá hot spring cave. A little further to the east, you can find the seething mud-pits and steaming fumaroles of the barren Námaskarð Pass, and a little further east from here, you can find three more great waterfalls, part of the Jökulsá á Fjöllum river. 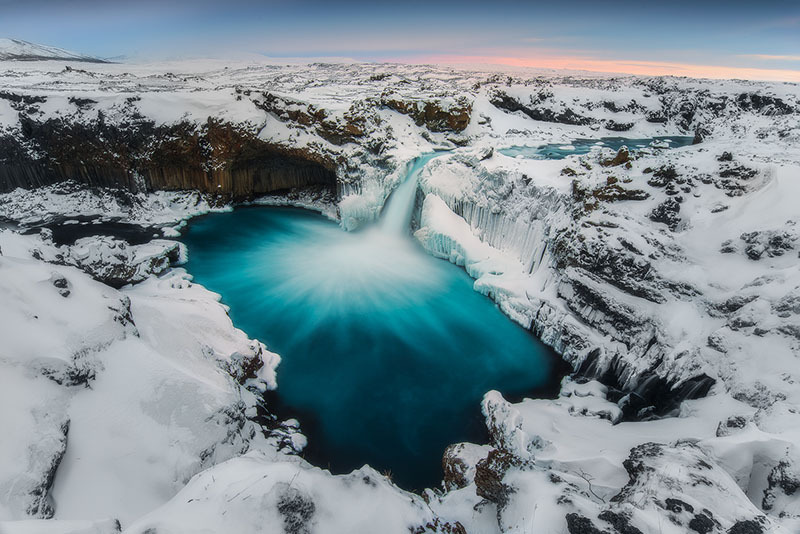 These are named Selfoss, Dettifoss and Hafragilsfoss, and while all are magnificent, Dettifoss is undoubtedly the most impressive, being the most powerful falls in Europe. Just north of here is the dramatic, forested horseshoe shaped canyon of Ásbyrgi. Hverfell is an explosion crater on the east side of Lake Mývatn in northern Iceland and is one of the largest explosion craters in the world. The diameter of the crater is 1000 metres and it is around 140 metres deep. It was formed in a volcanic explosion some 2800-2900 years ago. Hverfell is also known as Hverfjall, both spellings are correct. 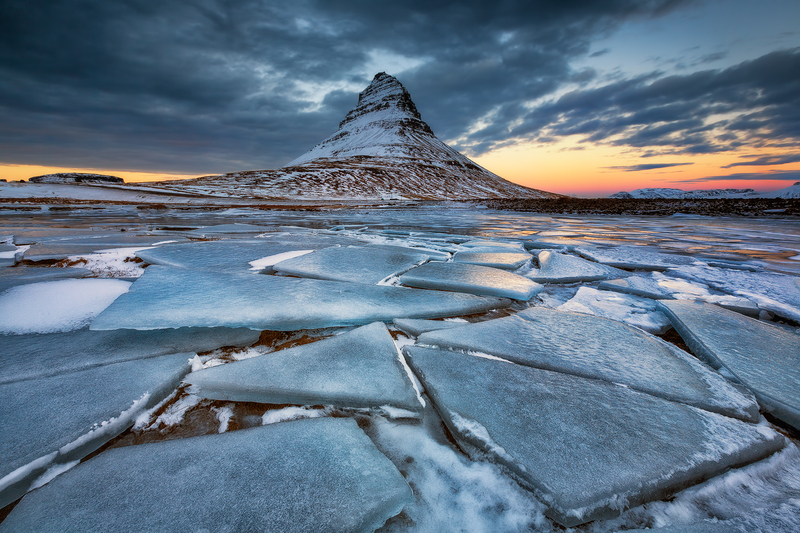 Snæfellsjökull National Park is found on the tip of the Snæfellsnes Peninsula and is one of three National Parks in Iceland. It is named after its crowning glacier and volcano. Established in 2001, it is neither the oldest nor the largest National Park; those honours go to Þingvellir and Vatnajökull respectively. Within its borders, however, it has a wealth of sites for visitors to enjoy. Snæfellsjökull National Park’s main feature is obviously the sub-glacial volcano Snæfellsjökull. This twin-peaked phenomenon is at the tip of the peninsula, and visible across Faxaflói Bay from Reykjavík on clear days. It has inspired artists and writers for centuries. Most famously, it was the primary setting for the Jules Verne novel ‘A Journey to the Centre of the Earth’ and the Halldór Laxness novel ‘Christianity Beneath the Glacier’. Beyond its inspiration to artists, the site also provides adventure to thrill-seekers; it is a popular place for both glacier hiking and super jeep tours. Another feature within the National Park is the Buðahraun lava field, which encircles the glacier. This moss-coated terrain gives the area a haunting, otherworldly air, especially when grey or snow-coated in the winter months. 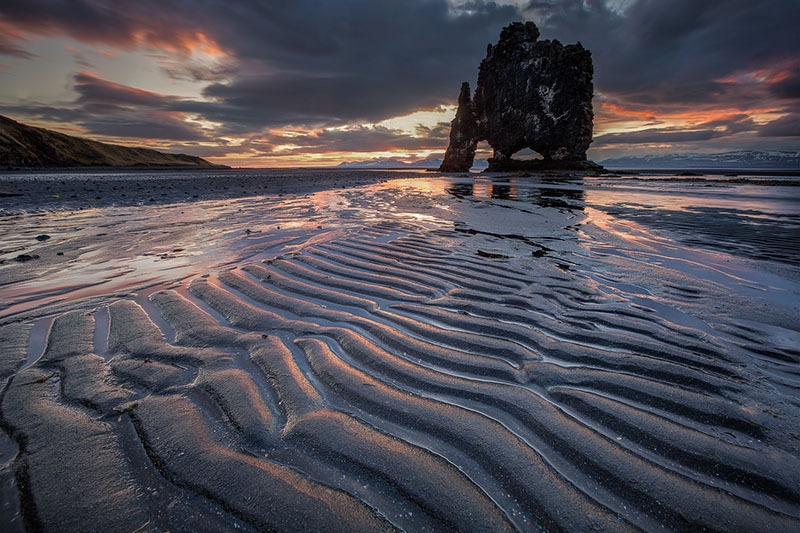 The coastline is also worthy of some time sightseeing; the beaches of Djúpalónssandur and Skarðsvík have fascinating geology, beautiful seascapes, and interesting histories. The Lóndrangar basalt fortress, however, is perhaps the most dramatic and picturesque example. A final feature of the National Park is its lava caves. While most of these are inaccessible, you can take tours into Vatnshellir throughout summer. 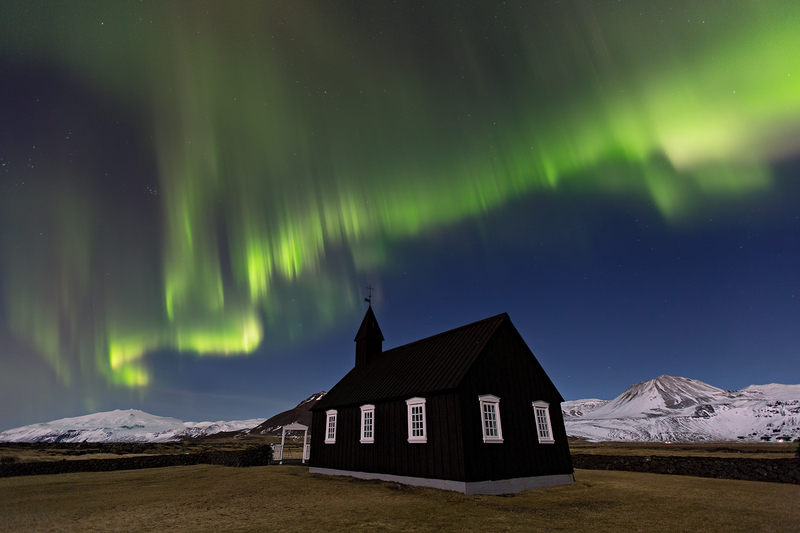 Snæfellsjökull National Park is adjacent to Arnarstapi and Hellnar on its south, and Hellissandur and Ríf on its north, all historic fishing villages that have managed to preserve the old culture of the peninsula when it was Iceland’s trading hub. All four of these settlements have options for accommodation. Within an hour of driving, it is possible to reach many other sites of Snæfellsnes. 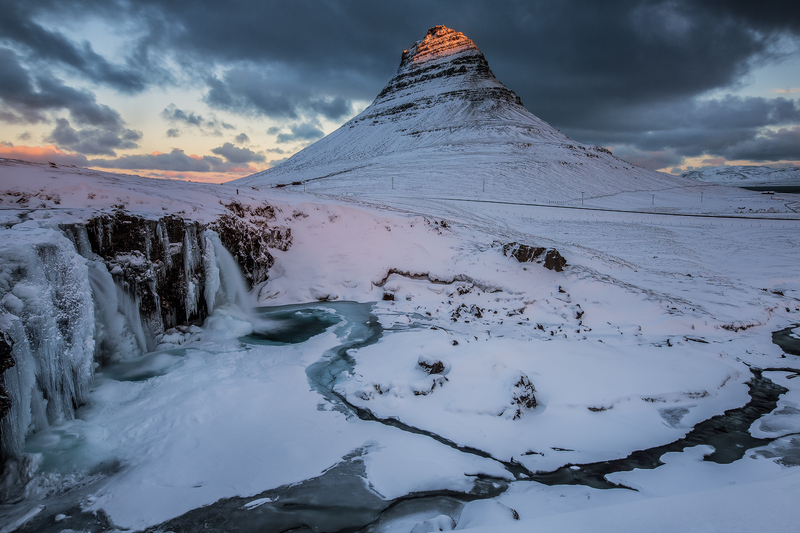 These include the second most defining mountain on the peninsula, Mount Kirkjufell; Ytri Tunga, a seal-watching beach; and Rauðfeldsgjá, a mightily impressive gorge that slices into a mountainside.